Telephone: 1-800-593-7660 (toll-free) TTY Maine Relay: 711 Customer Service Available Mon-Fri, 8:00 a.m. to 12:30 p.m.
Have questions about Unemployment? Visit our Contact page! Need help resetting your ReEmployME password? Visit the ReEmployME login page! Want to Login to your account? 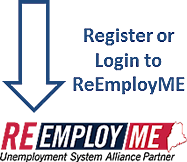 Visit the ReEmployME login page!